"What a wonderful way to learn the basics of Seascape Photography! I spent three days with Chris taking me through the processes needed to achieve the perfect image. I mainly learned about Composition, Light, using filters and how to balance the exposure. I enjoyed good food and great company with Chris and Sam in their lovely home... I have been bitten by the bug!!!" 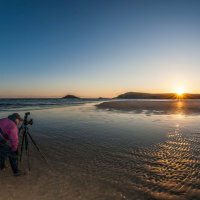 If you are considering taking-up photography, then there's no better way than to get one-to-one guidance to show you the ropes and guide you through the pitfalls. That's the whole idea behind my Beginner's Seascape Workshop.